At CHC we are always looking for people to join the club, be it as a player, coach, administrator or in any other volunteer capacity. Our junior program has over 300 juniors from age 6 to 16 participating in a range of teams and intra club programs from Hookin2Hockey up to our Shield U16 teams. Training nights from 5.30 to 6.50 for our U16s on a Monday night and U14s on a Tuesday. On Thursday our U10s train from 4.50 to 5.50 and our U12s from 5.50 to 6.50. Our Intra Club U10s and/or Hookin2Hockey run on Wednesdays from 5.30 to 6.50. U14 and U16s play on a Friday night and our U10 HV teams and U12s on a Saturday morning. Our Women’s Section fields 6 senior teams and 2 masters teams in the winter program, and caters to a wide range of players, from the social player up to the elite level player. Our Premier League squads train on a Tuesday from 7-8.30 and a Thursday from 8.30 to 10. Our Pennant A, B, F and Metro teams train on a Wednesday night from 7.00 to 8.30. Games for our senior teams are on Saturday afternoon or Sunday, and our two masters teams play on a Wednesday night (no training required). Our Men’s Section fields 10 senior teams and 11 masters teams in the winter program, and with teams from Metro level all the way up the Premier League, can cater to any player. Our Premier League squads train on a Tuesday from 8.30 to 10 and a Thursday from 7 to 8.30. Our Pennant D,E & F train on Wednesday from 8.30 to 10 and our Pennant A,B and C on a Tuesday at Koonung from 7.30 to 9. Games for our senior teams are on a Saturday afternoon or Sunday, our O35 and O45 masters play on a Monday night, and our O50s on a Wednesday night. Are you an overseas player looking to play in Australia for our winter season? Our season runs from March to September and we are located 20 minutes from the heart of Melbourne in the inner east suburbs. We welcome any inquiries from male or female players. Email the club and we will be in contact with you very shortly. Not only do we help develop elite players, but we also help develop elite level umpires as well. 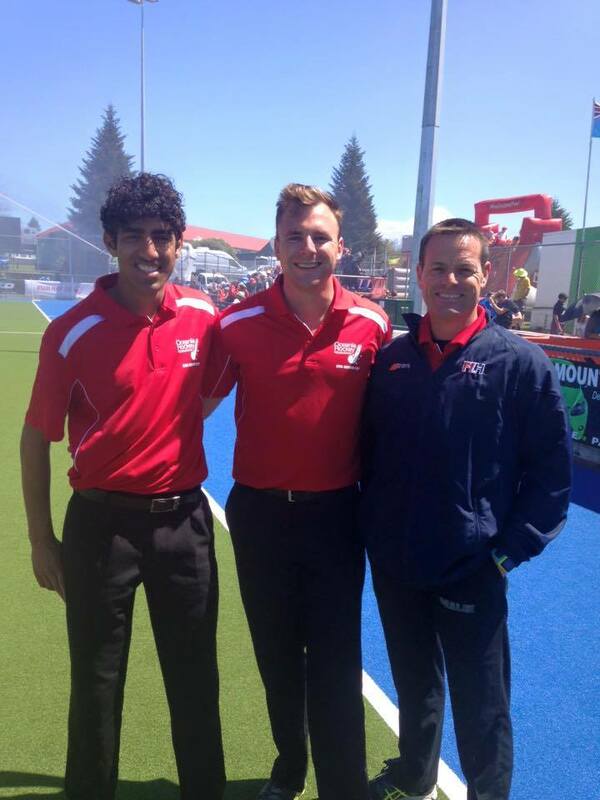 Jim Unkles is a current FIH badged International Umpire and we have many umpires, both male and female, that not only umpire at Premier League level but at Nationals as well, with many of them having come through our Junior Umpire Development Program. With so many teams we are always looking for coaches, new or experienced, accredited or otherwise. With our junior teams we try and assign 2 coaches per team and if you’re just starting out we’ll pair you with an experienced coach. Our junior coaches can gain experience helping coach our Hookin2 Hockey programs or our U10 programs. Our Men’s and Women’s Sections also welcome coaches for their vast range of teams. Check back here for coaching availability for the 2018 season. Note: Players coaching junior teams get their fees for the Winter Season paid for them. Our club survives on the hard work of our generous volunteers, without which we could not exist. We would love your help. Being such a large successful club is not possible without the significant effort put in by our vast range of volunteers. Everything from coaches to team managers, umpires, age group coordinators, administrators, committee members, and game day help are all done by volunteers and all contribute to making Camberwell Hockey Club the club it is. Our coaches are responsible for planning and running weekly training sessions and running the bench and coaching the team on game day. They are ably supported by our team managers who work on the administration of the team, responsible for entering scores, paying umpires on the day, team communications etc. For our juniors each age group has their own coordinator who is responsible for overseeing their group. They provide contact details of all players to team managers, forward relevant information from the club to team managers for distribution to players and help manage the training roster of their age group between our two grounds. On game day there are a few activities that need to be done by volunteers at our home grounds, be it running the scoreboard, helping with the Tech bench for Premier League games, providing half time refreshments for your team, or manning the BBQ or cake stall on one of our many Club Days. Each section has their own Committee that usually meets once a month to discuss and plan all things section related. Committee members are given roles for the year from communications for your section, social and fundraising, registrar, treasurer, team liaison, etc. Our Board Members are nominated and elected at our AGM every November.